11-6pm Farm Bureau Family Fun at Windermere Point Come jump, climb, crawl, squeeze and slide your way to a fun start during the Lilac Festival Free Family Fun Area located at Windermere Point. There is fun for kids and adults of all ages. 3:30pm-5pm Grand Hotel Afternoon Tea Enjoy tea, sherry and champagne, petite finger sandwiches, fresh-baked scones and more. $30, no reservations necessary, dress is resort casual. ($10 admission fee for non-guests of Grand Hotel). Mackinac Island Legends and Lore Trek Guided walking tours through Mackinac Island State Park, $10 per person. Call 231.590.5731 for times and availability. 9:30-11:30pm Alex Graham & Grand Hotel Orchestra Come hear what all the fuss is about as Graham and company take you on a musical journey. Grand Hotel dress code: coat and tie for gentlemen, dresses or pantsuits for ladies (after 6:30pm). 10:00pm Downtown Entertainment Musicians and DJs take over the stages in our downtown pubs. 1pm-5pm Michigan Beer and Wine Tasting, Bistro on the Greens at Mission Point Resort. Featuring wines from Black Star Farms, Good Harbor along with Michigan Craft Beers. The nominal fee includes a souvenir glass. 11am Historic Downtown Buildings Mackinac State Historic Parks opens the doors to Biddle House, Benjamin Blacksmith, Birch Bark Chapel, American Fur Company Store and McGulpin House for the season. 11am-4pm Mackinac Island Public Library Annual Book Sale Stop in and pick up some books to support our library. The Library is a architectural gem and was designed by Richard Bos of Royal Oak, Michigan and the interior design is by Carleton Varney, who is also the interior designer for Grand Hotel. 10am-3pm Go Lakers! To help raise funds for the Mackinac Island Lakers sports programs, the school has set up a great fundraiser of all things wearable to show your team spirit. Mackinac Island Public School. 1-5pm Michigan Beer and Wine Tasting, Bistro on the Greens at Mission Point Resort. Featuring wines from Black Star Farms, Good Harbor along with Michigan Craft Beers. The nominal fee includes a souvenir glass. The Executive Chef and his team are creating the Island first pig roast open to the public during the Lilac Festival, which will be paired with craft beer flights and lilac inspired cocktails and lilac lemonade. Prices vary. 1pm Walk and Talk with Lilacs Learn about Mackinac’s lilacs and how to care for yours with Hort Farm lilac curator and nationally recognized lilac expert Jeff Young. Meets at the Mackinac Island Tourism, across from Arnold Ferry. 1pm Learning About Lilacs Learn how to transplant your own baby lilac (baby lilac included in the free event). Lilacs provided by Proven Winners. Ste. Anne’s Church Yard. 1-3pm Artist Signing Local Michigan Artist, Karen Alley Williams will be signing her artwork and answering questions at Island Breeze, located on Main Street near the Horse Corral Mall. 5:30 & 8:30pm Sip N’Sail Mackinac Bridge Sightseeing Tour aboard the Isle Royal Queen III Experience the Mighty Mackinac Bridge up close from an entirely new perspective, the panoramic view of lighthouses, forts and nature of the shores of the Straits. Amazing photo opportunities and fun! Live narration and lively background music. 7-9pm Dancing’ in the Streets Learn Country Line Dancing with the West Michigan Bootscooters, located in front of the Stuart House Museum on Market Street. Everyone welcome! 2:30-4:30pm Lilac Festival Art Poster Reception This lovely exhibition/reception will feature the works of those who have entered the annual Lilac Festival Art Print Call for Entries. Held at Little Stone Church. 3-5pm Great Turtle Voyage aboard the Isle Royal Queen III Experience the natural beauty of Mackinac Island from the water. Appreciate the spectacular panorama of the Island with your camera, favorite beverage and LIVE music by Pete Kehoe from the decks of the Isle Royale Queen III. Other sights include Round Island lighthouse, Mackinac Bridge, Grand Hotel & the north side of Mackinac Island. 10am Grand Hotel History Lecture This is a must do event with hotel historian Bob Tagatz, Grand Hotel, meets on West Front Porch (inclement weather, will meet at Audubon Wine Bar). Included with $10 hotel admission. 10am Walk and Talk with Lilacs Learn about Mackinac’s lilacs and how to care for yours with Hort Farm lilac curator and nationally recognized lilac expert Jeff Young. Meets at the Mackinac Island Tourism, across from Arnold Ferry. 10am-12pm Outdoor Photography with Steven Blair Join professional photographer, Steven Blair an exciting discovery of light through the lens. Bring a camera and walk around beautiful Mackinac Island as he shares his knowledge and instructs on how to take stunning photographs of Mackinac Island Lilacs and surrounding nature. This two hour class is $10, cash or check only please, and meets outside of the Mackinac Island Tourism building. 3pm Walk and Talk with Lilacs Learn about Mackinac’s lilacs and how to care for yours with Hort Farm lilac curator and nationally recognized lilac expert Jeff Young. Meets at the Mackinac Island Tourism, across from Arnold Ferry. 3pm Learning About Lilacs Learn how to transplant your own baby lilac (baby lilac included in the free event). Lilacs provided by Proven Winners. Ste. Anne’s Church Yard. 3-5pm Concert at the Park Local Musician Pete Kehoe performs at Marquette Park. Pete Kehoe is a singer/songwriter and composer for film & television. His music can be heard on many cable TV channels/shows, PBS documentaries, and has won several awards as a performer in northern Michigan in the last decade, as well as a Michigan Emmy for original documentary music. He is co-director of the Mackinac Island Songwriters Workshop and owner of 231 Music. 7-9pm Lilac Festival Street Hockey Tournament Islander & hockey fan Jamie Bynoe rallies all to join in this great street hockey tourney with the Labatt’s Blue Mackinac Leaves vs. the Budweiser Black Hawks Meets at the Windermere Point Dog House. 8:30-10pm Sip N’ Sail Sunset Cruise Reserve a front row pass to a Lake Michigan Sunset! Watch as Mother Nature paints vibrant colors across the canvas of the Straits. Sail under the impressive span of the Mackinac Bridge while sipping on your favorite beverage and listening to LIVE music by Charlie Reager. 12:30pm Nature Tour with naturalist Trish Martin Trish writes the nature column for the Town Crier and knows so much about the flora and fauna of Mackinac Island, luckily she is willing to share her knowledge. Wear good walking shoes. Starts at Bogan Lane Inn, Free. 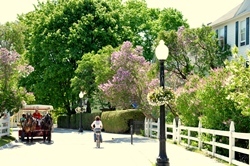 to take stunning photographs of Mackinac Island Lilacs and surrounding nature. This two hour class is $15, cash or check only please, and meets outside of the Mackinac Island Tourism building. 6pm Evening Stroll Walk with Lilacs Learn about Mackinac’s lilacs and how to care for yours Hort Farm lilac curator and nationally recognized lilac expert Jeff Young. Meets at the Tourism Bureau. 6:30pm Lion’s Club Bingo In 1917 Chicago businessman Melvin Jones suggested civic groups ban together to make better communities all over the world and to make the world a better place. Mackinac Island Community Hall (18 & over only. 9pm Jazz Night Spend an evening enjoying hot jazz in a cool setting with Grand Hotel musicians. Located at the Gate House. 9:30-11:30am Governor’s Summer Residence Tour The Lawrence A. Young cottage is a Shingle Style Victorian Era Cottage overlooking the lake and was donated to the State of Michigan for its Governors. Adjacent to Fort Mackinac. For a horse drawn taxi, call (906) 847-3323, two person fare minimum. 1pm Harbor Cruise on the Ugly Anne Tour the straits of Mackinac on this repurposed Maine Lobster boat. Reservations suggested, $24 per person, call 231-436-5094. 2-3pm Irish Ceili Dance Session All are invited to learn new dance steps and more about Irish culture with Ardan Academy of Irish Dance. Join the fun at Windermere Point. 3-5pm Beer Tasting at the Draught House Mackinac Island’s newest watering hole features 200 beers from around the globe on draught. Prices vary. Star Line Dock at Main Street. 9:30am Walk and Talk with Lilacs Learn about Mackinac’s lilacs and how to care for yours with Hort Farm lilac curator and nationally recognized lilac expert Jeff Young. Meets at the Mackinac Island Tourism, across from Arnold Ferry. 11:30am-1:30pm Annual A Taste of Mackinac Mackinac Island’s most anticipated culinary event. Located at the Harbour View Inn, $20. Please check back for ticket locations. This award winning luncheon also features products from Coca Cola, the official soft drink of the Mackinac Island Lilac Festival along with award winning Michigan Beer & Wine (for those 21 & over with proper ID) and delicious coffee and tea from our local Starbucks. Live music and entertainment provided by Ardan Academy of Dance and Local singer/songwriter Michelle Chenard. 3pm Learning About Lilac Learn how to transplant your own baby lilac (baby lilac included in the free event). Lilacs provided by Proven Winners. Ste. Anne’s Church Yard. 6pm Evening Stroll Walk with Lilacs Learn about Mackinac’s lilacs and how to care for yours Hort Farm lilac curator and nationally recognized lilac expert Jeff Young. Meets at the Mackinac Island Tourism, across from Arnold Ferry. 12-2pm Art’s Little Luxuries Acclaimed local watercolor artist Mary Lou Peters will be painting and displaying her works at Little Luxuries of Mackinac Island at Lilac Tree Mall. 3pmLearning About Lilacs Learn how to transplant your own baby lilac (baby lilac included in the free event). Lilacs provided by Proven Winners. Ste. Anne’s Church Yard. 5pm Feast of Epona Blessing of the Animals Join us as we bless the horses, dogs, turtles and more at this auspicious event. Presented by the Mackinac Island Carriage Tours and the Mackinac Island Dog & Pony Club. Little Barn at Mission Hill. 6pm Cannonball BBQ Hayride Take a meandering hayride from downtown to British Landing for a relaxed dinner on the shoreline at the Cannonball Drive Inn, a tradition since 1905. For pricing and reservations: (906) 847-0932. Reserve a front row pass to a Lake Michigan Sunset! See for yourself as Mother Nature paints vibrant colors across the canvas of the Straits. Sail under the impressive span of the Mackinac Bridge while sipping on your favorite beverage. Live narration and tunes provided by DJ Mike Williford. 10-11am Rise N’ Shine Cruise Start your day with a serene, relaxing sail on Lake Huron. Your trip includes your choice of coffee or juice and a muffin or pastry. Relax & enjoy a Mimosa or Bloody Mary (additional fee). 10:30am Walk and Talk with Lilacs Learn about Mackinac’s lilacs and how to care for yours with Hort Farm lilac curator and nationally recognized lilac expert Jeff Young. Meets at the Mackinac Island Tourism, across from Arnold Ferry. 11:30am-12:30pm Bloody Mary Cruise You pick the ingredients to create the perfect bloody mary while taking in the beauty of the Straits of Mackinac. Mimosas, juice, beer, wine and more! 12pm Learning About Lilacs Learn how to transplant your own baby lilac (baby lilac included in the free event). Lilacs provided by Proven Winners. Ste. Anne’s Church Yard. 1-4pm Purple Pig Roast, Bistro on the Greens at Mission Point Resort. The Executive Chef and his team are creating the Island first pig roast open to the public during the Lilac Festival, which will be paired with craft beer flights and lilac inspired cocktails and lilac lemonade. 1pm Epona & Barkus Parade This zany parade is a blast …so come join in or watch the parade of canines dressed to the hilt…. starts on the boardwalk from the school to Windermere Point. Presented by the Mackinac Island Dog & Pony Club. Sail under the Mackinac Bridge while sampling some of Michigan’s finest Microbrews and listening to the songs of summer. Amazing photo opportunities and fun! Live narration and lively background music. Reserve a front row pass to a Northern Michigan Sunset while sipping on bourbon and enjoying select savory snacks as you sail under the Mighty Mac! Witness as Mother Nature paints vibrant colors across the canvas of the Straits. Unwind with music by local favorite, Pete Kehoe and enjoy scenic views. 8:30am Walk and Talk with Lilacs Learn about Mackinac’s lilacs and how to care for yours with Hort Farm lilac curator and nationally recognized lilac expert Jeff Young. Meets at the Mackinac Island Tourism, across from Arnold Ferry. 11am-12pm Bloody Mary Cruise You pick the ingredients to create the perfect bloody mary while taking in the beauty of the Straits of Mackinac. Mimosas, juice, beer, wine and more! Tickets are$15 per person. 3pm Scottville Clown Band The Scottville Clown Band’s roots date back to the start of the 1900’s when a musical group of merchants began to dress as hillbillies while entertaining at local carnivals. Marquette Park, presented by Doud’s Market, Michigan’s oldest family run grocery store. 4pm Lilac Festival Grand Parade presented by Coca Cola Considered a Local Legacy Event by the United States Library of Congress, this festival finale is led by the family of Don Andress, Carl Andress & Jamie Andress-Islanders and direct descendants of Chief Mackinac along with Don and Darold Keith, descendants of Chief Pontiac and Chief Okemos. this awe inspiring event than from the deck of the Isle Royale Queen III. Sail under the impressive span of the Mackinac Bridge while watching the sun set. LIVE music by Charlie Reager.